Cynefin documents five different domains, earliest documentation is in article on Complex Acts of Knowing back in 2002/2003.This link is an archive of the Creative Commons version of Complex Acts of Knowing in case the Wiley link goes down. Obvious - this is the domain of Best Practices, where everyone knows how to operate, so it is process of just doing what everyone knows how to do. Complicated - this is the domain of learned expertise, there are multiple good answers, but careful analysis might be needed to discover the way forward. One metaphor refers to this as the domain of the bicycle, if it is not working right you can take it apart, discover what is broken and then reassemble it. Complex - this is the domain where good answers are only discovered in retrospect. A metaphor for this is that of the frog - you cannot take it apart, discover what is wrong and then reassemble it, you have to try different treatments on the whole organism. Dave Snowden talks about Safe to Fail experiments in this domain. Chaotic - this is the domain of no clear cause and effect, so you just need to take action to try to move out of the chaotic state into one of the other domains. Disorder - this is the domain of not knowing which domain you are in. There are some things in software development that fall into the Obvious domain, but mostly there is an existing product or library that handles this domain for you. So if your application needs to store some data, then depending on what the data is, the choice of the filesystem, transient cache, a database or offsite cloud storage will be obvious. There may be some debate as to the flavour and/or vendor of the storage mechanism, but storing data is a known problem with well known solutions. In part some of my Software Craftsmanship book was raising issues about using techniques that are relevant to the Obvious domain in Software Development. A Factory with a mechanical metaphor is appropriate for the Obvious domain, after all we know how to assemble a car. But the reason we know how to assemble a car is because experts working in the Complicated domain did a lot of Design for Manufacture work on the design of the car so that it could be economically made in a factory. Designing an assembly line is a very complicated process, but once it is built, it is Obvious what you are supposed to do at each work station along the line. In software development, all of the Obvious domains are well served, so what is left is the Complicated and Complex domains where off the shelf solutions are not available. 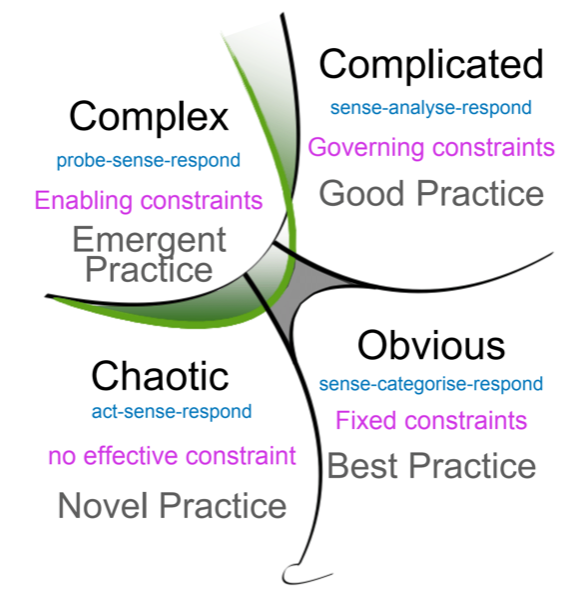 Looking back up to the image of the Cynefin domains, some Methodologies are better suited to domains that are not very Complicated, bordering on the Obvious, others like Jim Highsmith’s Adaptive Software Development are targeted at working in the Complex domain, with the three project phases of speculation, collaboration and learning. Another take on "How Hard Can It Be?" Learning the world, an introduction to SQL for Business Analysts. Uses PostgreSQL but most of the SQL in the book is standard and could be used on any other database. Might need an appendix or web reference for other database specific queries looking at the table catalogs. When asked how particle physicists address group-think, Gianotti explains instead why some research avenues require large communities. Sabine Hossenfelder’s book Lost in Math has a lot more about the background to this. The obvious fun question that arises from this is where are we doing this in software development? Not got any examples I can share, but the thought occurs that I have seen quite a few projects be stressed of fail due to delays in starting working on the project. Something to ponder when looking at specific delivery dates and finding that the start of the project is delayed. One problem with using biometrics as an authentication mechanism is that mere presence is not authentication. Aside from some more gruesome science fiction stories – does the finger with the finger print need to be attached to the rest of the body – there is also the case that just because the finger touched the sensor, it does not mean that the person intended to unlock anything. Another problem is environmental, when it is -40 or below, who wants to touch anything? Another case is sterile environments – you do not want to touch anything with bare skin after scrubbing up. A related problem exists in industrial environments where hands might be exposed to paint, ink, oil or any of a wide variety of other substances that make reading a finger print unreliable. Denial of service is also a problem in cases where the relevant print is damaged or hidden due to injury. Overall, biometrics might be a possible solution for some extreme situations, but for the run of the mill unlocking access to most real life transactions, they do not provide the necessary intentional action or ease of use. Identity Theft, Impersonation or Weak Authentication? Although Identity Theft has entered the lexicon, it is just sloppy journalism. Nobody is stealing the identity of another person, what they are doing is stealing identifying information about other people. This then becomes a problem because all too many companies, organizations and systems use identifying information as an authentication token. Ever seen a library system that uses the last four digits of your phone number as your password? Have banks finally stopped asking for Mother’s Maiden Name? The problem is that Weak Authentication has become the default for too many companies, organizations and systems, and our legal systems have not put the onus of fixing this in the right place. Why is it suddenly the victim’s problem when a bad actor takes out a loan in the victim’s name? Recently ran across a talk by John Seddon where he talked about trying to do the wrong thing righter. It made me wonder if we do similar things in software development. Are we getting better at doing the wrong things? Something like the XML RPC specification that was improved to make the Simple Object Access Protocol specifications, known as SOAP under auspices of the World Wide Web Consortium (W3C). This lead to the need to have tools to write and validate XML Schemas, leading to 1000+ line WSDL files that describe the SOAP end points. This blog started back in 2006 running under Typo, it had a long run but in 2017 after upgrading the version of ruby it stopped working properly. Finally got around to fixing it, by upgrading to Publify, the successor to Typo. Remarkably easy just to set it up and them migrate over the data to the new database schema. One thing I have noticed now that it is running under Rails 5.2.x is that it is much slower to restart and to serve new content than the original version that ran under Rails 2.3.x. Yes, Publify has a lot more features, but since I do not support comments/trackback/ping/twitter etc. on this blog, most of the extra stuff is not used, so what I really notice is that it is much, much slower. Could also be that I have been working with Elixir/Phoenix recently and have got used to the speed of that for development and page rendering, so moving back to Rails just feels slow now. The EFF has resigned from the consortium because Today, the W3C bequeaths an legally unauditable attack-surface to browsers used by billions of people.